You can’t get much simpler (or cheaper) than this arrangement. I thought I might like a nice arrangement for my table during the holidays, but now that it’s done, it may sit on the little table outside on my front porch….haven’t decided. I basically started with the candy canes and added from there. I started by putting a little dab of hot glue on the glass jar and tilted the first candy cane to rest against the edge on the gob of glue. The glue is inside the rim and can’t be seen. I decided to glue three candy canes around the rim, each spaced about 1/3 of the circle apart. I am not sure if I will keep the arrangement or dismantle it at the end of the holidays, but hot glue peels off quite easily, so I wasn’t concerned about the vase. I then took the second set of three candy canes and secured them together with the silver bow (and a few dabs of hot glue). 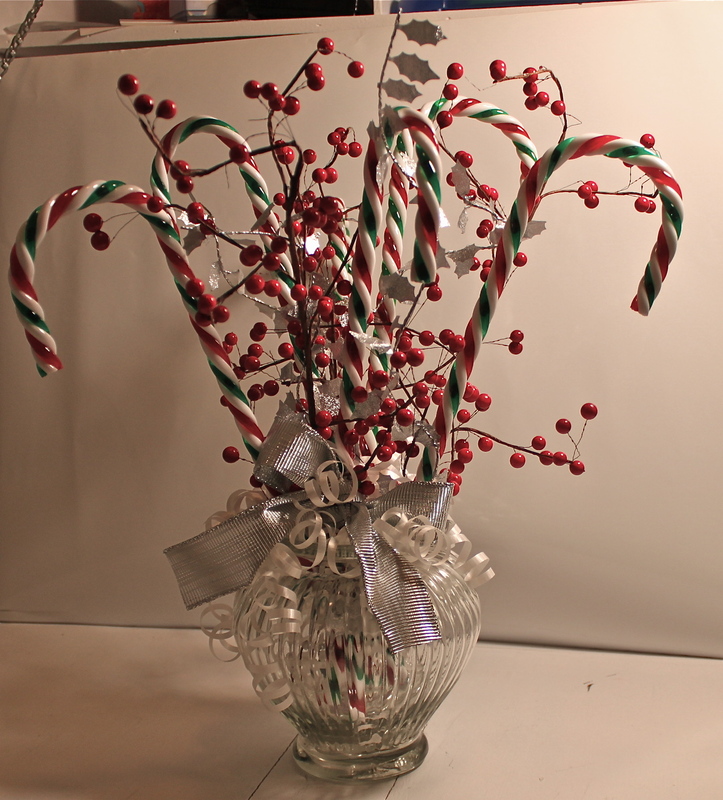 These were more upright and straddled the first set of candy canes nicely to sit more in the middle of the arrangement. 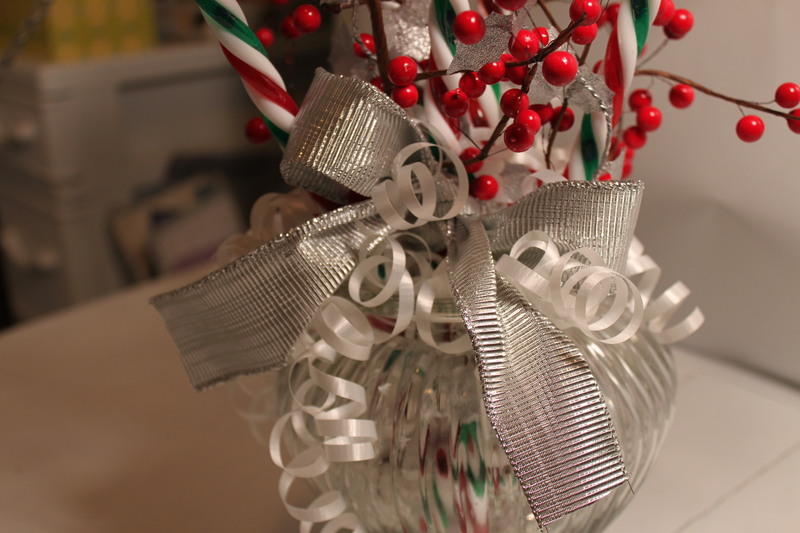 I then added the glass beads to help hold the candy cane based in place. I then began to “fill” the arrangement. I curled several lengths of plain white ribbon and used it as filler, spilling over the top of the glass jar. I didn’t secure any of the ribbon, just poked it in here and there and hooked it around some of the candy canes. I then carefully pulled the tiny sprigs of the wire berries to give them more dimension and a bit of a whimsical look. Finally, I added a few lengths of the wire garland, randomly twisted throughout the arrangement. *I was thinking that if this were made for outside, you could probably add a bit of water to the jar and the ice would act as the base to hold everything in place, instead of using glass beads. All in all, this was mostly made up of odds and ends I already had on hand. The candy canes were 2 or 3 dollars and the berries another 3. Not bad for under $10! Posted on December 22, 2013 by Cindy Roy •	This entry was posted in All Things Christmas!, DIY and Upcycling and tagged center piece, Christmas centre piece, Christmas table arrangement, decorating for the holidays, decorating on a budget, holiday decor. Bookmark the permalink.